S is for SKILLS. This year I am concentrating on learning new ones, practicing and perfecting ones that I have and taking advantage of at least two classes to help me develop my skills as a dressmaker. So far, I am enrolled in Craftsy’s “Sewing with Silks: The Liberty Blouse” on-line course (not started yet), and I will be spending a week in Baltimore with Susan Khalje for The Classic French Jacket Class. Perhaps other classes will wiggle their way into the year as well! M is for MARKING AND MEASURING my progress and accomplishments, my mistakes (hopefully not too many! ), and my plans and intentions. 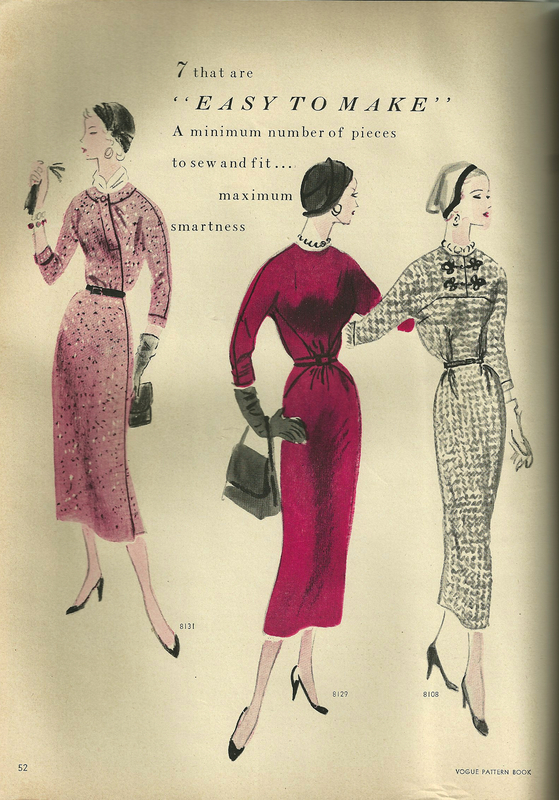 This is, of course, where “Fifty Dresses” comes in. Writing this blog helps me focus more on the process than I would normally – and that’s both instructive and rewarding. So thank you from the bottom of my heart to all of you who follow along, make comments, give me encouragement, and share your sewing insights and ideas through your own blogs or other online presence. Thinking, reading and writing about sewing is almost as much fun as sewing itself. A is for ART. Sewing is so much more than a “hobby” or a way to build a wardrobe (albeit slowly!). It really is an art form, and the more I sew, the more I realize and appreciate this fact. Some of my creations will no doubt be like simple sketches – quick and easy to make and even easier to throw on for a trip to the grocery store – while one or two others perhaps will rise closer to “masterpiece” level (I can dream) – made with finest fabrics and specialized techniques, intended for special occasions. Good art should be taken seriously and seriously enjoyed, don’t you think? R is for REALISTIC, as in having realistic goals of what I can and cannot accomplish in a set amount of time. This is the part I have trouble with. I always think I can sew faster than I can. Although I am sure I will always plan more than I can possibly accomplish, I am going to try to set more realistic goals (keeping a separate, working list of intended projects to help me focus) in the context of what I know will be a busy year in other aspects of my life. T is for TIMELESS. This may be my favorite part of the acronym. Timeless is the look that I am always striving for in the clothing I make. Using vintage patterns for the most part allows me to choose styles that really have stood the test of time – and which often have a restrained classicism to them that suits my sensibility. 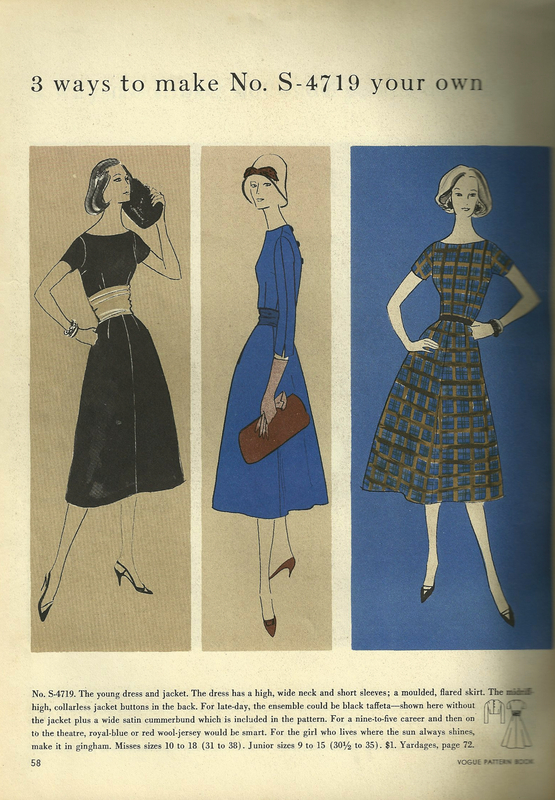 Sketches in Vogue Pattern Book Magazine from October/November 1956 show styles which look very au courant, from the clothing to the hair to the shoes and accessories. I’d like to be that lady in red! How stylish are these looks from the same magazine? And a box-jacket suit is always in vogue. 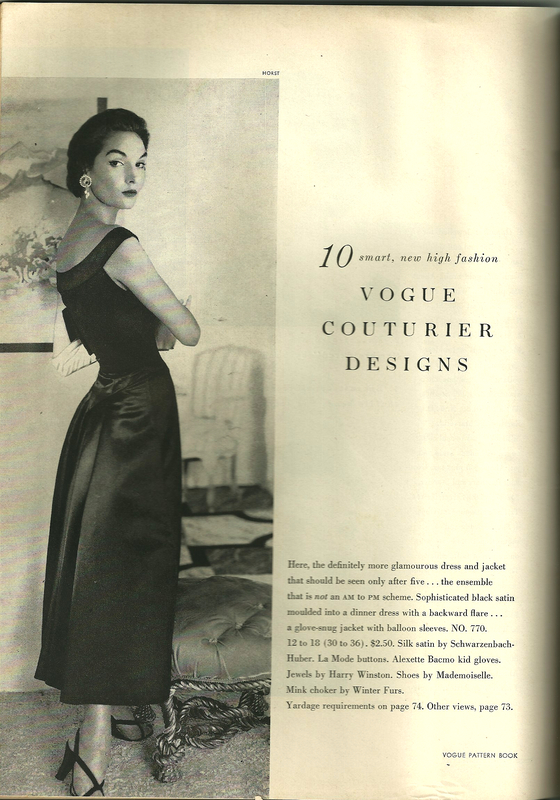 It’s fun to see current color and style trends, which harken back to 40, 50, or 60 years ago. Then to make them, using vintage patterns, with newfound construction knowledge, in some of the beautiful fabrics available today, is the best of many worlds. Not only SMART, but lucky, too, in 2013! Oh, I like your acronym! I can’t wait to see what you sew in 2013! It IS interesting how writing a blog about sewing does make you think more about the process. And my blog (along with a digital camera) has definitely helped me document my projects better – looking back at some of my old pre-blog portfolio photos, I realize how little I remember about the details of how I actually made some of those things! And I am looking forward to seeing what you CREATE in 2013, too! I am SO looking forward to Susan’s class. It’s not for a while, yet, so I am trying to contain my excitement! You ARE that lady in red! When are you going to B’more? I’ll be in the class the last week of March and would be beyond excited if you were too! Oh my gosh, that would be amazing – however, I’m in the June class as our daughter’s baby is due that last week in March – and I’ll be otherwise occupied! Somehow, I thought you had already taken this class? Perhaps you are taking it again? I have taken it, Karen. Twice! I think I will make a Chanel-type dress this time instead of another jacket. I have 3, which is enough for my lifestyle! You’ll love the class. I always learn so many things from Susan! Karen, thanks for another wonderful blog post to start off the New Year. This time I learned what a finger-tip coat is. 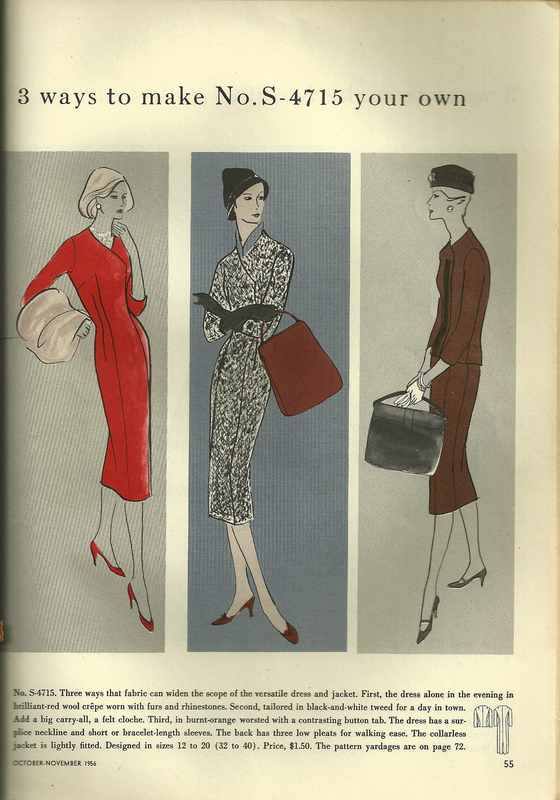 I Googled Images and found a drawing of one by designer Marjorie Field c.1960 in the Victoria and Albert Museum collection. Wouldn’t that make a nice way to document a project. Just a simple pencil and pen drawing with short notations to one side. Isn’t that a great term – “fingertip coat”? I will definitely have to track down that Marjorie Field image – thanks for the tip! Thanks, Susanna! So far I have a list of sewing projects outlined through June, which is as far as I can think right now. Snowy New England was a good place to debut my snowflake pants, don’t you think? I envy you so much!! Have fun at Susan’s class and let us know the details! I’ve taken the Craftsy Liberty Silk Blouse class and learned some good tips. I’m sure you’ll enjoy it. 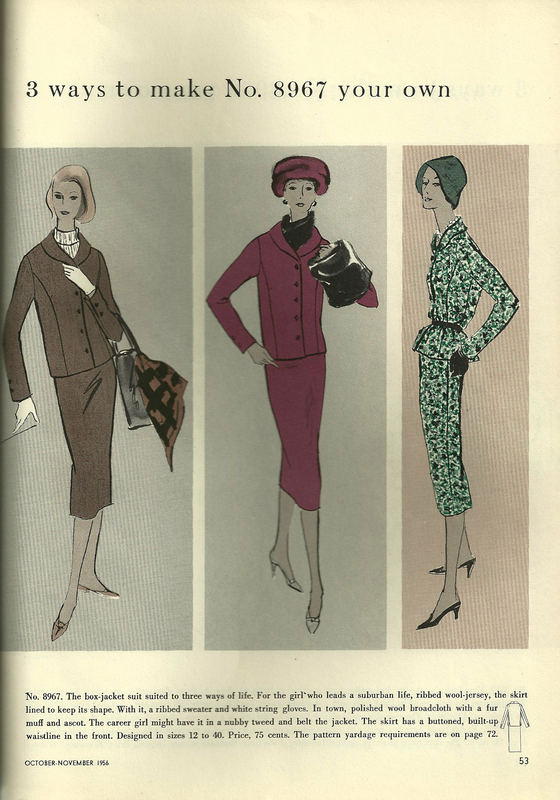 Btw, the Vogue vintage pattern book’s dress styles are modern, elegant and definitely on trend, good picks! I will definitely share news about the class, which is still a long way off – just the stuff of dreams right now. I love the acronym! But more than that I agree with the points that you’re making. Sewin is about so much more thank just ‘making clothes’. For me it’s about learning, creating and enjoyment! I really look forward to sewin what you creat this year! And isn’t it wonderful that we can all share our enthusiasm about sewing with each other, no matter where in the world we call home? Yes! That is the best part of blogging! Clever idea, having an acronym for your goals, such a good memory aid, and those sketches are inspirational too. Glad you like the sketches – there were many to choose from, all quite wonderful! The acronym is a great idea. I need to work on Realistic, too, in my garden goals. My seed list is a bit… ambitious. I love all the beautiful things you’ve sewn. You need to start a photo gallery page on the blog to make it easy to see them all! I’ve found being “realistic” isn’t always as much fun in the short run, but it helps in the long run! I still have trouble with it…. I’ll think about a photo gallery – thanks for the suggestion! How do I contact you? 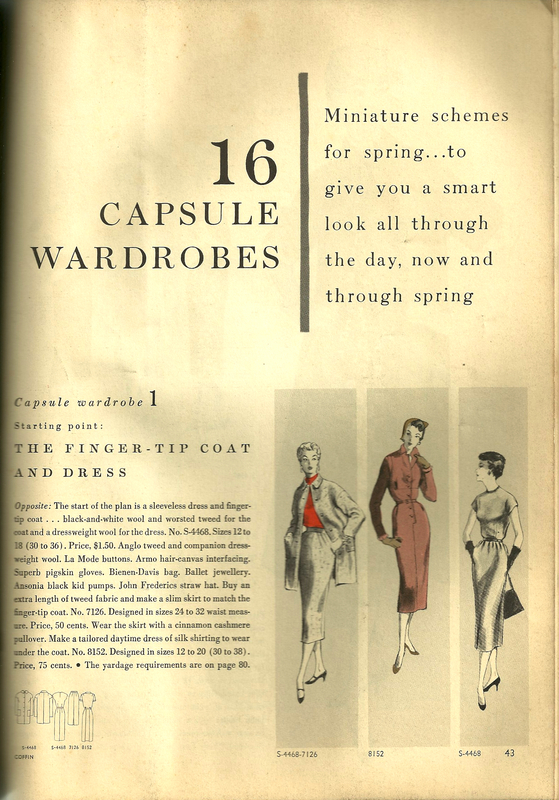 I am desperately looking for the full layout of the 16 Capsule Wardrobes from Feb/March 1954… my library doesn’t have the bound issue, and I am trying to find it for my research. You may contact me at fiftydresses@gmail.com.